Fact 1: here in the U.S., where vast tracts of land are devoted to agriculture, where the majority of this land is planted with GMO crops, where the world’s largest and most successful ag-bio corporation responsible for GMOs is based, one in six Americans is facing hunger. Monsanto’s “feed the world” mantra isn’t even succeeding in its own country. Fact 2: the problem is not a lack of food—the world already produces more than enough food—the problem is poverty. Fact 3: one in five U.S. children is living in poverty—giving the United States the highest child poverty rate of any developed nation except for Romania. 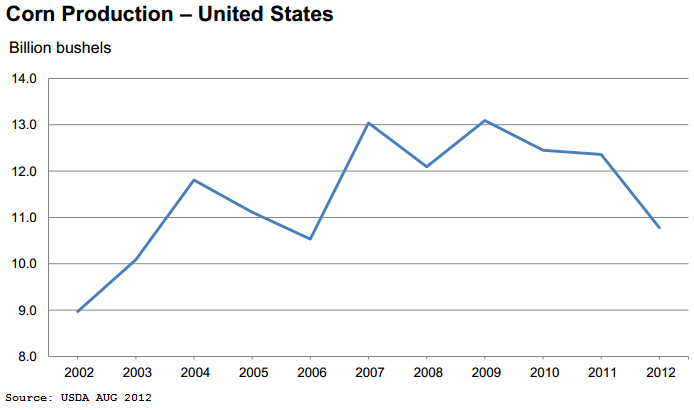 View more recent poverty data here. Fact 4: corporate control of food is dramatically increasing the cost of food. The chart at right represents the rising cost of corn, during the same timeframe that corn began to be genetically engineered, patented, and owned by huge ag-biotech companies like Monsanto. 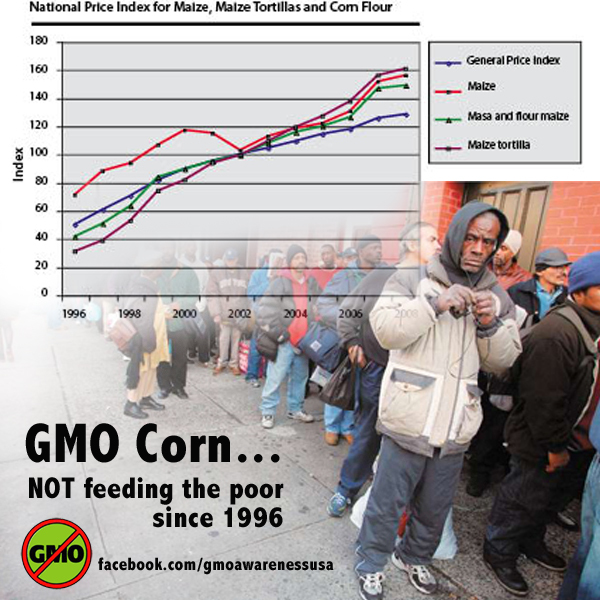 Corporate control of seeds, patents, farmer contracts, and third world agriculture systems does not improve poverty. It improves corporate profit margins. More profits > fewer employees > rising unemployment > less income + higher food prices = more poverty. While the problem is admittedly far larger than genetically engineered food, it’s clear that corporate control of our food system is not improving world hunger… instead, corporate control appears to be exacerbating it. In the case of Monsanto and several of the other leading ag-bio corporations, their profits come from more than just seeds and crops: the vast majority of GMOs are engineered to withstand weedkillers like RoundUp, the sales of which have skyrocketed as weeds continue to evolve resistance to the chemicals. (Remember, most of world’s ag-bio companies were chemical companies before they “remade” themselves into “agriculture solution” companies). Fact 6: GMO crops are not being used to “feed the world.” View a synopsis of what GMO corn is used for: the overwhelming majority is a) converted into a wide variety of additives and ingredients used in fast / pre-made / processed food, b) fed to animals raised for meat*—which is purchased primarily by middle and upper class families, c) converted into ethanol to fuel cars—also purchased primarily by middle and upper class families, and d) converted into fast food containers and utensils. None of these uses has any positive impact on world hunger. *Grain-fed beef, pork and chicken are typically fed GMO grain, unless specifically raised as certified organic and/or 100% grass-fed. Fact 7: The related claim about GMO crops bearing “higher yields” as a justification for feeding the world is also false. Study after study has proven that GMO crop yield is no greater than conventional crops, and in the case of soybeans, it’s less. Causes include soil degradation due to the increased use of chemicals, increasing insect resistance to the crops that were genetically engineered to resist insects, and increasing weed resistance to weedkillers (which crops were genetically engineered to tolerate). In summary: corporate control of food is not benefiting world hunger… it’s benefiting corporate profit margins. *True price of food: the cost without tax subsidies (link to video). This entry was posted in GMO Information by GMO Awareness. Bookmark the permalink. Aloha From Hawaii; Lies, is what they are good at. On Hawaii…Big Island, people got together & protested till we got it banned from our Island.. We lost our Papayas, before we could do anything about it. We still have some corn, that’s it, no more after that… Now the fight is on Oahu, so many acres they got, it’s SICK, now the people are busy on that Island. Our Council listened to the People 2 times, passed what the People Wanted. Then Our Great Mayor signed it into Law… We are Lucky to a point. We have a lot of Coffee Growers here that use Round Up, & that has to go to. Don’t use any chemicals on any plants… Funny living on an Island, I try to remember what did they do without all these bad things, we are going back to that, so get ready growers…People want good Coffee, I don’t drink it, but I know it goes down to our water table and runs off to our Ocean, not good for those animals either, best none at all. Read Labels of all you eat, I go by if I can’t say it, don’t get it. Natural Flavors, what is that? Be Truthful tell the Truth. We eat no Soybeans either. People here use Soybeans a lot, sad. People lived to this time, what did they do in Westerns Time? We want good Healthy Food from out Farmers, not food we can not eat or we will be very sick. Seen the pictures of rats with tumors hanging out of there bodies, that alone makes you not want to eat anything with that in it. How can you own any food? Isn’t it everyone’s food, so how can anyone/Corp. own FOOD????? No you can’t do that. Now when you talk about plants and mix two plants to change colors, shapes, you can put your name on it and own it, you changed it, you can be the only one that has the right to that plant–we don’t eat them, they are not food. Think you can change food and its for the better, you are wrong, so stop. 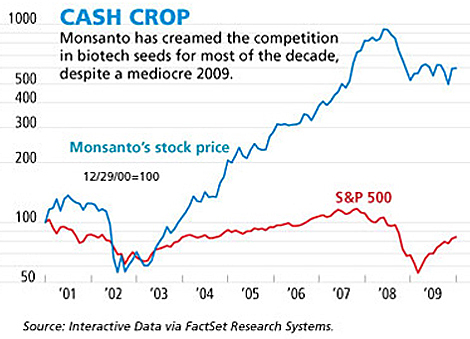 Read a piece yesterday a farmer put all his money into the bad GMO seeds, all the plants died, none grew at all. So he has to get good seeds and try again? Did he make his soil-dirt bad? Time will tell. There are 129 Countries that will not let any GMO-seeds, or GMO plants into their Country, what does that tell you? 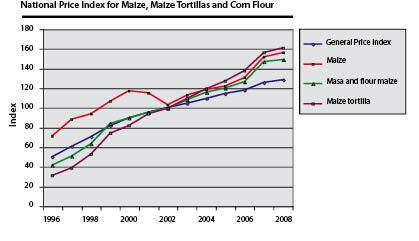 Let us not forget either that GMO BT corn feed is responsible for the decrease in longevity in our livestock. Cattle fed this tripe have an average TOTAL life span of 180-185 days before it kills them. Swine 30-35 days. 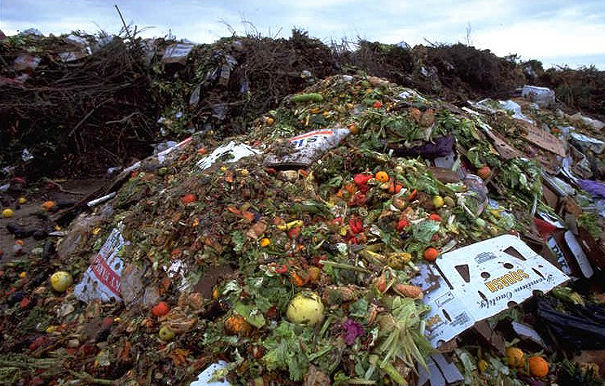 Why on earth would We want our food to be poisoned in such a manner and then consume it? I sure as hell DONT want this garbage any longer , how about you???. Thanks for helping to raise awareness! PEOPLE WHO VOTE ON THIS ISSUE SHOULD ONLY BE ALLOWED TO VOTE IF THEY KNOW THE FACTS. TOO MANY UNINFORMED VOTERS ARE AT THE POLES…CHIPPING AWAY AT IGNORANCE IS A HUGE TASK. KEEP UP YOUR GOOD WORK. Thanks for helping to raise awareness, Nicole! Pingback: Overpopulation: Fact Or Myth? Pingback: Overpopulation: Fact Or Myth? | Earth. We are one. I was recently diagnosis with irritable bowels syndrome and informed by my doctor she was not aware as to how this happened in other words what caused it, however a nurse informed me I need to look into GMO foods and the affects of GMO, and said I could possibly find my answer to my syndrome. Which landed me to searching out others with the condition etc., to make a long story short I learned that GMO and the pesticides sprayed on the GMO crops ect., leads to IBS, this is really devastating not to mention that I have always tried to eat healthy I never knew eating healthy was eating wrong, i.e., vegetables, fruits, fish, chicken and turkey. I am now looking into eating Organic foods but however have been told that IBS is not reverasable and is a miserable condition, it depletes ones life from day to day in pain etc., and there is no cure or medication for it since very little studies have been done on the condition. IBS is actually a genetic disorder, and acquiring it would mean tampering with the very source that codes your body: DNA. A pesticide would have to be specifically designed to target the SCN5A gene in order to give you this syndrome. If you eat foods and get bowel problems, you probably just need to switch up your diet and eat more fiber or something, because the likelihood of food or pesticides pinpointing your genes in such a fashion would be very low. My husband had severe IBS, he eats mostly organic foods now and the IBS is gone. If he eats at a restaurant or non organic foods the IBS flares up. I had IBS as a young adult, it left when I got a divorce! As a nurse for 30 years I have seen many cases of IBS, it can be eliminated with decreased stress, clean healthy foods, diet modification. We have seen several examples of this within our circle of friends and family too. 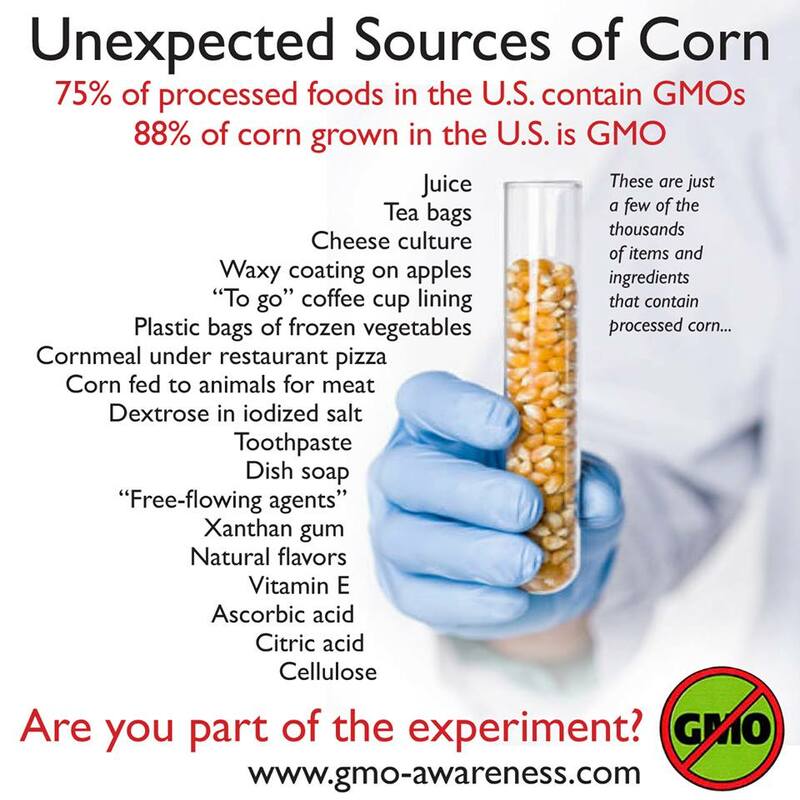 I have been learning about GMOs and the information contained here has been both informative and easy to understand. Thank you. You are most welcome. Thanks for becoming aware!